Name: Thomas Francis Bayard, Sr.
Thomas Bayard was a U.S. senator from Delaware, secretary of state, and ambassador to Great Britain. From a prominent political family, he was the grandson, son, and father of senators, James Asheton Bayard Sr. and Jr. and Thomas Bayard Jr., respectively; his mother was Ann Francis Bayard. In his youth, Thomas Bayard Sr. received a private-school education. At the age of 15, he began working in a mercantile house in New York, where the family had moved temporarily, then worked in Philadelphia during 1846-1847. In lieu of college, he began reading law in 1850 in Wilmington, Delaware, passing the bar the next year. He became a successful real-estate lawyer in Wilmington and Philadelphia, and as U.S. district attorney for Delaware in 1853-1854. Bayard married Louise Lee in 1856; they had nine children. During the Civil War, he was a Peace Democrat, opposing both Confederate secession and the Union military effort as unconstitutional. 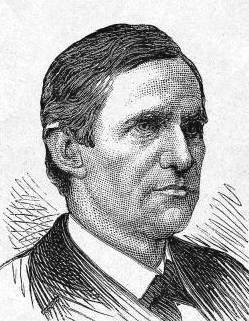 In 1869, the Delaware legislature elected Bayard to succeed his father as U.S. senator. An advocate of limited government, the new senator opposed the Reconstruction program of the Republicans, subsidies and grants to railroad and shipbuilding companies, and high protective tariffs. He endorsed civil service reform, tariff reform, and resumption of the gold standard. He became well-respected and liked on both sides of the aisle, and in 1877 was chosen as a Democratic senate representative on the Electoral Commission, which decided the contested presidential election of 1876. In 1880 and 1884, he was a leading contender for the Democratic presidential nomination, but was hurt by his strong stand on the issues and his previous position against the Civil War. In 1885, President Grover Cleveland appointed Bayard as secretary of state. Serving in the first Democratic administration since before the Civil War, Secretary Bayard was flooded with requests for office, but largely abided by his civil service principles to make appointments based on merit, not partisan connections. Much of his time was taken negotiating with Great Britain concerning a longstanding dispute over fishing rights. In February 1888, Bayard and British colonial secretary Joseph Chamberlain signed a treaty defining which Canadian waters would be open to American fishermen. The Republican-controlled senate, however, rejected the Bayard-Chamberlain treaty in August, a few months before the fall elections. Although Bayard failed to get an agreement from the British to curtail their seal-hunting practices which were threatening the herd with extinction, his efforts set the stage for a future treaty (1893). Likewise, his negotiations regarding a conflict between Germany, Britain, and the United States over Samoa laid the groundwork for a future settlement. When Chinese workers in Rock Springs, Wyoming, were attacked in 1885, killing 28, the Chinese government demanded that monetary damages be awarded by the American government. Bayard denied the federal government's legal responsibility for the acts of private citizens, but said that the president could make such a request of Congress as an act of generosity. The American government paid the Chinese an indemnity, and Bayard negotiated a treaty which banned the importation of Chinese workers for 20 years. The Chinese government refused to ratify the treaty, so the American Congress responded with the Scott Act of 1888 which unilaterally enacted the terms of the treaty (and extended the terms of the 1882 Chinese Exclusion Act). Following Cleveland's loss of the 1888 presidential election, Bayard resumed his law practice in Wilmington. His wife having died, he married Mary Clymer in 1889; they had no children. After Cleveland won reelection to a nonconsecutive term in 1892, he named Bayard as the first U.S. ambassador to Great Britain (previous appointments having held the title of minister). In that position, Bayard strove diligently to improve Anglo-American relations. He caused controversy, however, when he publicly denounced the American government's policy of trade protectionism as a form of state socialism. Infuriated Republican congressman called for his impeachment before settling on official censure from the House of Representatives. In his last year in office, Bayard's health declined, and he died in 1898 in his daughter's home in Massachusetts. Sources consulted: American National Biography; Charles Campbell, The Transformation of American Foreign Relations, 1865-1900.